Home » General • Sea Fishing Articles » Mullet Fishing – Addictive but very, very frustrating! As a confirmed coarse fisherman (37 years and counting) and for most of that time an avid match angler, fishing in salty water was worlds apart from anything I knew. I fancied trying something different and having a go for some new species and mullet seemed the obvious choice. I wouldn’t need to buy loads of new specialised tackle as everything I’d read about mullet fishing suggested a simple float fishing set up with bread as bait would suffice. The trouble was I didn’t know where to go for my first trip or what I would do when I got there! 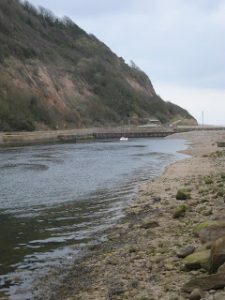 I remembered seeing people fishing on the river Axe at Seaton from day trips when I was a youngster and speaking to my mate Andy, he said he thought people fished for mullet there and a plan started to formulate. My next step was to phone the tackle shop in Seaton and the owner confirmed they catch mullet in the harbour and above the bridge and that most people fished bread for them. Andy said he’d be up for a trip to the seaside and a date was set in March. To be honest neither of us had a clue what we were doing and the most likely outcome was being rescued by the RNLI! We used match style float rods and reels loaded with 4lb Maxima with Drennan Chubber floats and biggish hooks (well size 10 and 12 hooks seemed big to me!). For bait we had a couple of loaves of bread plus some groundbait for feed. We took the tackle shop owners advice and fished just off the edge of the marina and also in the main river. It was a bit of an anti-climax and apart from a few indications that may or may not have been bites, we were starting to get disillusioned and thinking about packing up. 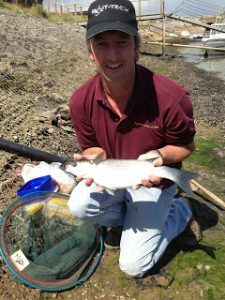 Then fish started coming up for bits of floating bread in the main river as the tide was going out so we started trotting down and we both missed some bites before I latched into a fish and netted a small mullet after a spirited fight. It only weighed 1lb 13oz but it was a new species for me and mission accomplished. I later found out it was a thick lipped mullet. The seed was sown and I couldn’t wait to get back for another go. Our next trip was a complete non-starter , it was cold and wet, totally the wrong time of year and the river was up and very coloured, needless to say we never saw a sign of a mullet. Doing some more research and talking to various tackle dealers, we were definitely on the right track but the best time to fish for them was in the summer. Fast forward to this year and with the country enjoying a hot spell my thoughts turned to mullet once again. Typically for our next trip, the weather was very changeable but we went back and fished the same spot we had previously, apart from seeing one fish top in the main river we were staring at another blank. Andy went for a walk to get something to eat but as he reached the marina he stopped, started pointing at the water in between the boats before running back and saying there were dozens of mullet in and around the boats. We got all of our kit together and moved to where he had seen them and sure enough there were mullet everywhere. Despite our best efforts, we blanked, although we both missed several bites but the trouble with mullet fishing is, that when you keep missing bites, you start to question whether they were bites at all. When it started raining quite hard and with the tide right out we headed back to the car with our tails between our legs. These mullet were proving to be very elusive and extremely difficult to catch. We were back again the following week and we used the same approach apart from we were now using 0.18mm hooklengths to try and bring some finesse to our set ups. Again there were mullet everywhere and again we missed bites (or at least we thought we did!) and once more a blank was staring us in the face, had those pesky mullet defeated us again? Then out of the blue my float disappeared and striking saw me attached to a decent fish. After a scrap that saw the fish make several powerful runs, Andy finally slipped the net under a fish that looked bigger than the one I’d caught on our first trip. I zeroed the scales and the needle settled on 3lb 4oz, a new personal best for me and I was over the moon. After a few photos I slipped it back and it swam off strongly. We missed a couple more bites (or did we?) before calling it a day with the tide at its peak. I felt gutted for Andy who still hadn’t managed to catch one. Chasing these silver ghosts is certainly addictive but also very frustrating but when you finally get one, all those hours spent cursing and swearing make it (nearly) worthwhile. I’m sure there is a home somewhere full of mullet anglers striking at phantom bites and muttering to themselves. So the next time you are headed to the coast, stick a rod and a loaf of bread in the car, you won’t (or maybe you will!) regret it.